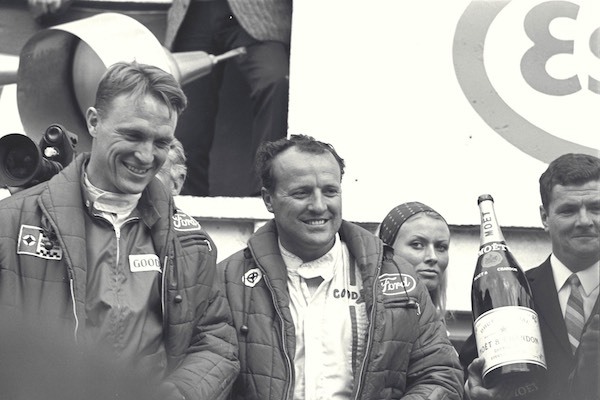 It was a Champagne week for Daniel Sexton Gurney back in mid-summer 1967, when he won the Le Mans 24-hours for Ford one Sunday and was a winner again the next weekend when he took the laurels in the Belgian Grand Prix in his own Eagle. Dan Gurney prepares a surprise for the audience that would go on to unexpectedly start a tradition. 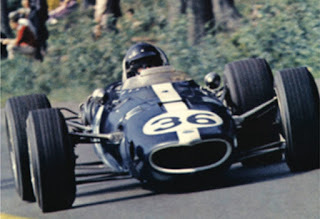 Dan Gurney was the first driver to spray the champers about rather than swigging it after he and A.J. Foyt had won at Le Mans. “I was so stoked that when they handed me the magnum of Moët I shook the bottle and began spraying at the photographers, drivers, Henry Ford II, Carroll Shelby and their wives. It was a very special moment.” Gurney made Champagne history when he sprayed the bubbly and the moment was captured on a special ‘Spray it Again, Dan’ fan poster. “What I did with the Champagne was totally spontaneous. I had no idea it would start a tradition. I was beyond caring and just got caught up in the moment. It was one of those once-in-a-lifetime occasions where things turned out perfectly...I thought this hard-fought victory needed something special.” “LIFE” photographer Flip Schulke, was a popular chap on the racing scene and Dan had hauled him up on to the stage before he started spraying the Champagne. “I took one photo and then ducked,” Schulke recalled. “When it was over Dan handed me the empty bottle and autographed it. AJ Foyt (right) and Dan Gurney (left) on victory stand. That original Moët Champagne bottle is now in pride of place in the conference room at All American Racers headquarters. Schulke had converted it to a table lamp and used it in his Florida home for 30 years before returning it to Gurney with the comment “You did it...you should have it!” Dan and Evi removed the lampshade, took the electrics out, and had a special glass case made to preserve the famous bottle. 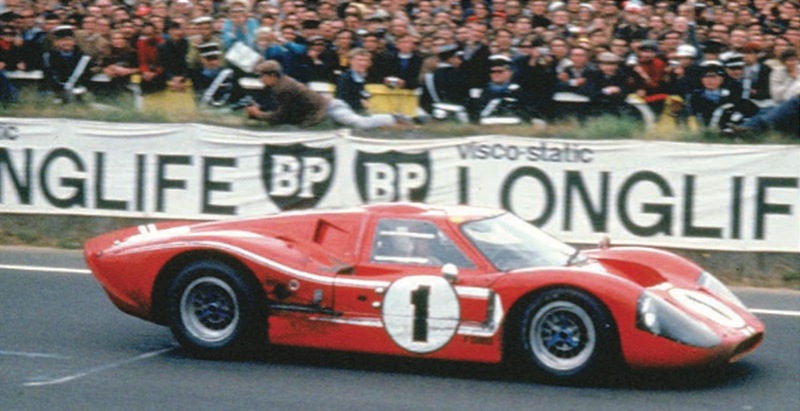 Gurney and Foyt drove their way into Le Mans history with the red 7-litre Mk IV Ford, specially modified with a bump on the roof to accommodate the lanky Dan. They raised the race record by 10mph to 135mph average for the 24 hours, covering a total of 3,250 miles. 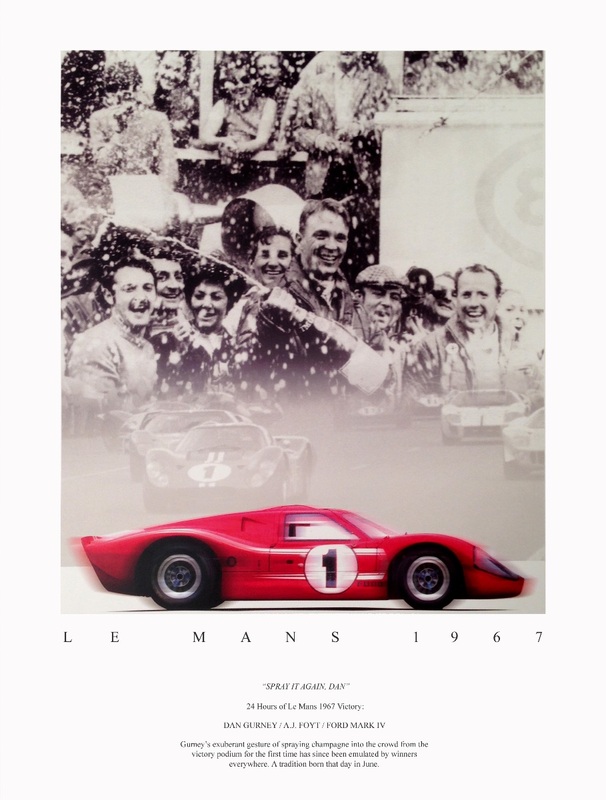 It was also the first time that an American car and driver combination had won at Le Mans. Dan Gurney takes the chequer to win the Belgian Grand Prix at Spa in 1967 in his Eagle-Westlake V12. Dan won at Spa in his own 3-litre V12 Eagle- Weslake. The 3-litre Cosworth-Ford V8s had arrived to win first time out at Zandvoort in Jim Clark’s works Lotus 49, and the two new cars bracketed the Eagle on the front row at Spa. Clark stormed into an immediate lead with Jackie Stewart second in the unloved H16 BRM with Gurney third. Gurney was moving in on Stewart when Clark pitted with a blown spark plug and Gurney also stopped to warn of fluctuating fuel pressure but there was nothing the crew could do so he was sent back out, now in second place, 16sec behind Stewart. Dan was now in attack mode, lowering the lap record as he chased down Stewart and went into the lead with seven laps left. It was Moët that Dan sprayed in those days and it was Moët that was presented at races thereafter on a gratis basis, Moët et Chandon presumably figuring that giving their bubbles free was financial involvement enough. But Bernie Ecclestone decided that ‘free’ was a word with which he was uncomfortable. He put the naming rights for the official alcoholic fizz in Formula 1 up for bids, and G.H. Mumm won. Dan might have been the first racer to spray the bubbly after a race win, but G.H. Mumm Champagne had arrived in motor racing eighty years earlier when Raymond Mays christened his Brescia Bugatti Cordon Rouge. Mays had been winning sprints and hillclimbs with the elegant lightweight Type 13 Bugattis that were in production from 1910 to 1926. In the 1930s Mays would create the ERA (English Racing Automobiles) racing marque and in the late 1940s he was the man behind BRM (British Racing Motors). The first BRM was a screaming 1500cc V16 which sounded far better than its racing record would read but a BRM would win the 1962 World Championship in the hands of Graham Hill. Gurney had a dismal summer with BRM in 1960 with a best result of 10th at Silverstone. In a 1973 interview, Mays told me the story about dining with his engineer friend, Amherst Villiers, in a London restaurant in 1923 when a Champagne label caught his eye. “I had just won a speed trial in the Bugatti and we were celebrating over dinner with a bottle of Champagne. 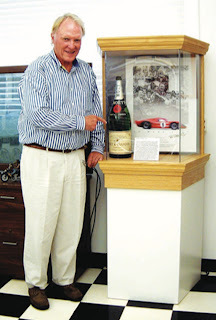 It occurred to me that the striking red and gold Cordon Rouge label on the bottle was just what I needed as a racing name for my Bugatti, and I suppose that was really where sponsorship in racing started.” At the time of the interview, Mays was 73 and still active as Director of Racing for the Marlboro-BRM team. That night in 1923, Mays asked the waiter if he could steam the label off the bottle as a guide for the name to be painted on the bonnet of his Bugatti and he wrote to the head office of the G.H. Mumm Champagne company, makers of Cordon Rouge in Reims, asking for their permission for him to borrow their brand name for his French racing car. The company replied immediately, delighted with the idea, and despatched three cases of Champagne to toast their new association with success. Pleased with this double result from the bubbly company, Mays wrote to the makers of Cordon Bleu Cognac but while he received permission to use the name on his ‘other’ Brescia, he was never offered any brandy! In fact this was inadvertently a first venture into the world of commercial sponsorship in motorsport that has led to the wheel turning full circle. Cordon Rouge Champagne is now the official bubby in Grand Prix racing for presentation and spraying on the Formula 1 rostrums. 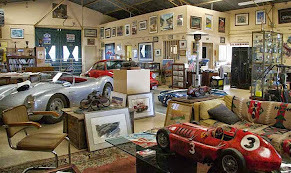 Tom Wheatcroft arranged with Raymond Mays to open his motor racing museum at Donington Park in 1974, linking with the UK importers of G.H. Mumm Champagne – half a century after Mays ‘discovered’ the label – and the bubbles started spraying in vintage racing circles with a replica of a Brescia Bugatti used in major store promotions. A special Cordon Rouge Classic Bugatti hillclimb was held by the Bugatti Owners’ Club at Prescott on June 2, 1974 and the winner at six vintage meetings during the summer was presented with a Jereboam of Cordon Rouge and each finisher received a bottle. Cordon Rouge Champagne had already been the toast of society for half a century when Mays, the young Cambridge graduate made racing history by being the first to carry what amounted to a commercial sponsor’s name on his racing car. That the ‘sponsor’ was a top Champagne company only added to the flair of Mays’ talent as a racing driver. With ‘Cordon Rouge’ he was to dominate speed trials and hillclimbs all over England during the summer of 1924. Mays, the son of a prominent wool brokerage family from Bourne, Lincolnshire, leapt to prominence in speed events in 1921, while still at Cambridge. He drove a speed model Hillman in those days and had such instant success that he invested everything in a new Brescia Bugatti for the 1922 season. 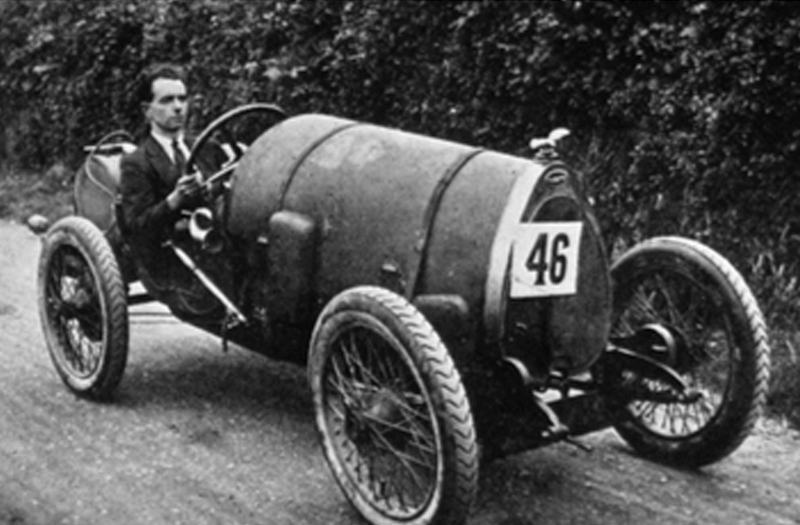 Once again he excelled and during 1923 the Bugatti was run in much modified trim. The speed and engineering so impressed Ettore Bugatti that Mays was provided with a second Brescia for the season of 1924, thus providing him with the need to differentiate between his two Bugattis. Raymond Mays in the Cordon Rouge Brescia Bugatti. The Brescia was a 1500cc 16-valve 4-cylinder sporting car, the competition models being Type 13s in the Bugatti numbering system. They won the voiturette race at Brescia in 1921 to earn the title and Mays made his debut with his Brescia at the Laindon hillclimb, facing Leon Cushman and Eddie Hall in similar cars and placed second in his class. By the end of the 1922 season Mays and the striking blue-grey Bugatti had become extremely competitive. During the winter of 1922-23 Mays began a modification programme on the Bugatti working with Amherst Villiers, a brilliant engineering friend from Cambridge days. Mays wanted a ‘super hillclimb car’ and Villiers designed new pistons and camshaft and made other modifications to boost the Bugatti’s engine from a rev limit of 4300rpm to over 6000rpm – an almost unheard of figure in those days. 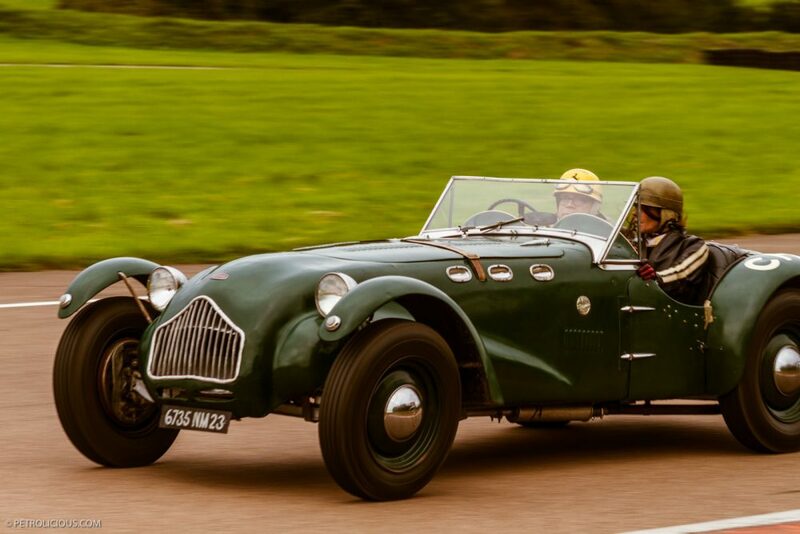 Running specially-brewed RD2 alcohol fuel – it cost over six shillings a gallon in those days which was regarded as insanely expensive – Mays found that he had the super-car he wanted, but there were development problems with bearings. Villiers was also an accomplished painter having produced portraits of subjects as diverse as Graham Hill and James Bond creator, Ian Fleming. It was Villiers who designed a fictional car to the fit the role of Chitty Chitty Bang Bang which Fleming was using as the theme for a children’s book. His painting of Mays at speed in the Brescia Bugatti was used by G.H. Mumm in a presentation and a poster for the Prescott Hillclimb that summer. M. Lefrere in Bugatti’s London agency, was most impressed and at the Show he gave Mays a personal letter of introduction to Le Patron, Ettore Bugatti. Bugatti invited the young Englishman to the Molsheim factory, emphasising that he bring his Brescia with him. Mays senior was delighted at his son’s newfound success and financed the trip to Molsheim, taking the modified car for Bugatti’s inspection. Ettore stood worked long and hard on the cars, Mays helping on evenings away from the wool business. Bleu was potentially faster than Rouge with its later engine, but it mixed success with misfortune, winning at South Harting and throwing a rear wheel at Caerphilly. After this hair-raising ‘moment’ the car was set aside for axle shaft changes, while Rouge howled from strength to strength, winning all over the country. in the All American Racers’ boardroom. The Brescia Bugattis finally ran out of hours and engines and Mays moved on but he had brought Champagne and sponsorship to motor racing, making history as he did so. 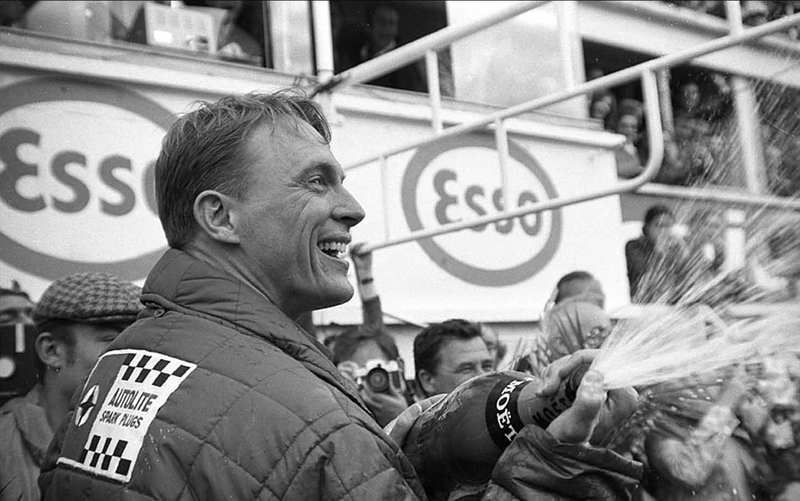 Dan Gurney might have been the first driver to spray the crowd after a race win in 1967, but Bernie Ecclestone made an extra little bit of history, whether he realised it or not, by bringing Cordon Rouge back into the motorsport winner’s circle! We here at l'art et l'automobile hope that your holiday season has been filled with laughter and joy, and if you're of the particular frame of mind, filled with champaign toasts and the occasional dousing. We hope you have enjoyed this little taste of Racing History, and that your spirits rise like the bubbles from the champaign flutes. 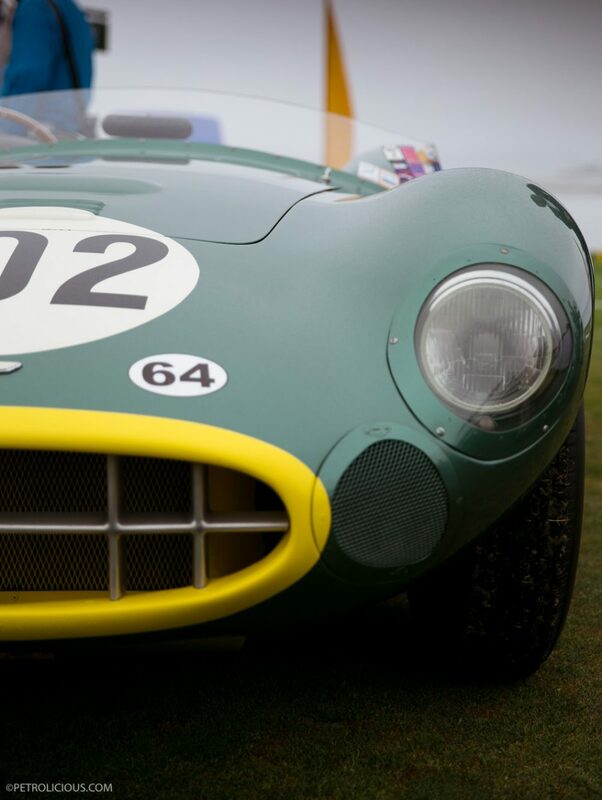 We also wish to toast Dan Gurney, who's accomplishments and exploits have not only gone down in racing history, but who's jovial spirit and gleeful nature have given us a much lauded tradition that racers still honor and celebrate to this day. Cheers to Dan and Cheers to you this holiday season! Remember we have a wide variety of items in our gallery, so do not hesitate to contact us if you are looking for something in particular. 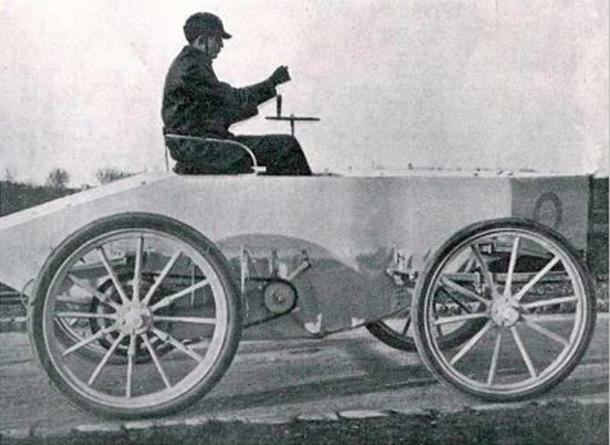 History: December 18, 1898: First Land Speed Record Ever, In an Electric Car! What is the fastest you have ever driven a car? The fastest you have ever been in a car driven by someone else? Feel free to share your high speed stories. 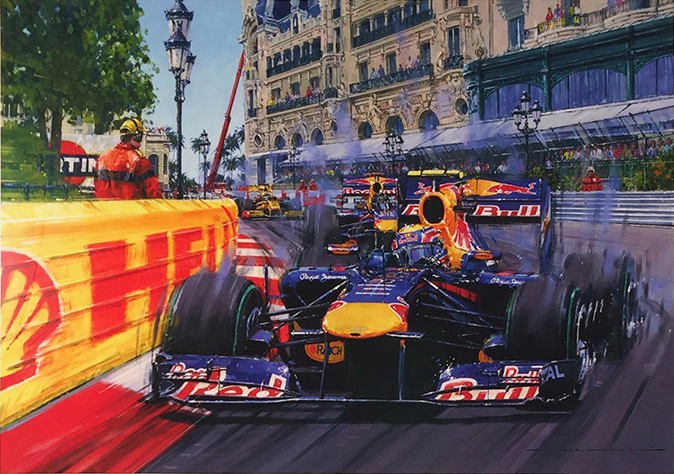 We here at l'art et l'automobile have an extraordinary appreciation and yearning for acceleration and velocity. A need for speed, if you will. We also appreciate the historical achievements of the daredevils who risk it all on an ever expanding quest for maximum velocity, and of the artists who capture these men and moments rendered in paint or sculpture. 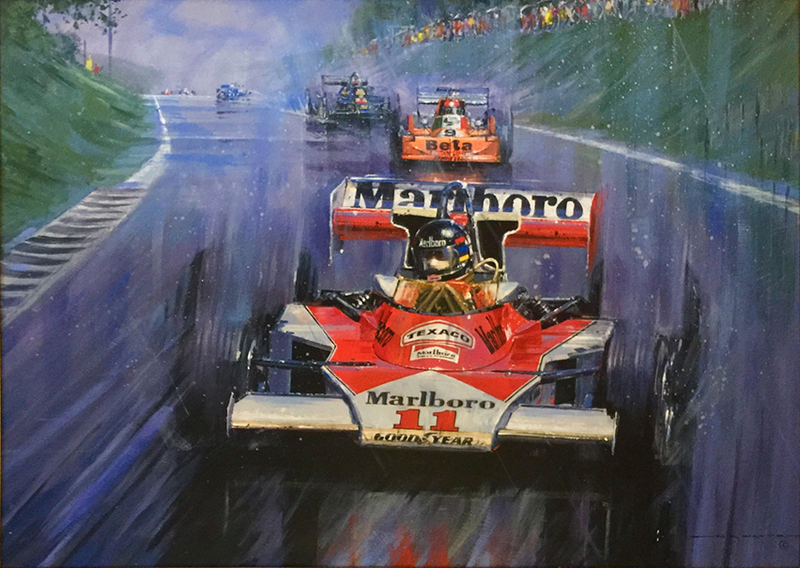 You can find a myriad of Artwork, Sculpture, Collectibles and Memorabilia depicting the pursuit of Acceleration in our Gallery, here at arteauto.com. Perhaps there you can find something that will satisfy your Need for Speed. Though NASCAR of today is the American national motorsport, its earliest days were not as magnificent and romantic as those in Europe where car races attracted the blue-blooded and the otherwise rich. In the beginning, NASCAR was closely entangled with one clear, highly flammable and potentially poisonous liquid. And no, it’s not gasoline, but moonshine, whiskey’s unaged, unlicensed and frowned-upon cousin. To understand NASCAR’s beginnings, we must travel back to 1920, when Eighteenth Amendment went into effect, prohibiting the use, production, importation and transportation of alcohol beverages. In the South, though, prohibition didn’t end in 1933; production and distribution of liquor were legal, the taxes were extremely high, so spirits were not affordable to the majority of Southerners. With that in mind, local distilleries turned to the production of moonshine and young guys who were in charge of its transportation were the pioneering drivers of NASCAR. Their task was to outrun and outsmart the police while thundering through the backwoods, delivering liquor to the bars all the way from Louisiana to Virginia. All that one driver needed to become a transporter was calmness, bravery, good knowledge of the terrain and a cheap car with a potent motor that was hard enough to handle the unpaved, bumpy and muddy Southern roads. The choice was obvious: the 1940 Ford Deluxe Coupé; a cheap, small and durable two door automobile with the famous Flathead V8 engine producing up to 100 horsepower, a short wheelbase that could ensure sharp turning and a decent trunk for all that moonshine. As soon as the police started upping their game, the dangers of moonshining suddenly became even greater and drivers were often arrested, serving prison sentences instead of racing during the weekends. To continue operating, both distillers and drivers had to resort to various modifications to ensure that their cars were still getting to the bars faster than the police. The earliest upgrades were of course all about horsepower and they later went as far as installing huge Cadillac engines. Very soon, they became even more ingenious, like brakes which could enable cars to corner even more swiftly by stopping just one side of the car, or switches that could turn off rear lights in the dark. That way, the moonshiner counterculture gave birth to the American hot rod. The greatest proof of driver’s quality was his freedom, but drivers soon found the need to distinguish themselves from their other moonshining colleagues. So, dirt oval races were the best weekend past-time and a chance to earn some extra money. The races quickly started gaining popularity both with the moonshiners and the crowds, and many races were organized throughout the South, often without any clear rules and highly variable prize money given away by shady promoters. One of the guys that drove around the ovals was William Bill France, a D.C. racer and mechanic who moved to Florida. He felt the need to organize the sport and after a driver meeting in December of 1947 at the Streamline Hotel in Daytona Beach, the National Association for Stock Car Auto Racing, better known as NASCAR, was born. That way, the sandy beach in Florida became the home of NASCAR. The first NASCAR sanctioned race took place on Daytona Beach on February 15, 1948, while the first Strictly Stock race was held on June 19, 1949, in North Carolina, at the Charlotte Speedway. The first main series champion was Red Byron. With NASCAR as the organizing body came the first sponsors, and the prizes were getting bigger, but the best drivers still held onto their perilous jobs in Southern backwoods. The pay of a moonshiner was still higher than the prize of a NASCAR race winner, so many ambitious racers still risked their freedom, often missing races because they served jail sentences. The practice stretched all the way to the fifties, despite the fact that NASCAR was already an established organization. NASCAR legend and six-time Winston Cup owners’ championship winner Junior Johnson was a second generation moonshiner himself, and he is the most successful bootlegger-turned-racer. As he once stated, all the best racers on the dirt ovals were, in fact, moonshiners. Very quickly, little Flathead Fords weren’t fast or agile enough to outrun the more-and-more powerful police cars, so, many moonshiners started switching to bigger cars with stronger V8 engines. That trend was mirrored on the tracks as well, where both the drivers and the racing fans benefited from the booming automotive industry. Full-size two door sedans were soon dominating the tracks, and one of the most iconic cars of that era was Hudson Hornet. Driven by Marshall Teague, Herb Thomas and several other drivers including the Fonty Brothers, The Fabulous Hudson Hornet dominated the NASCAR ovals with 13 wins in 1951, 49 in 1952, and 46 in 1953. The only early NASCAR requirement for entering the cars was that it had to be sold to the general public, and that’s how many strange cars ended up racing the ovals. With Detroit producing more and more powerful engines, the speed threshold was getting higher, so the cars started getting their first rulebook aftermarket modifications, mainly to improve durability and safety. With the stakes being risen higher and higher, the oval race cars soon became mere platforms and bodyshells upon which various improvements were made. That moment occurred in 1966 when Holman Moody grafted a Ford Galaxie onto a Ford Fairlane. The following step was welding a tubular frame onto the Fairlane unibody, and the move was emulated by Petty’s team as well. That started the trend which evolved into a highly regulated platform system we know today. The next big NASCAR moment came with the closer involvement of Detroit’s automotive companies which started purpose-building homologation vehicles for Grand National series. 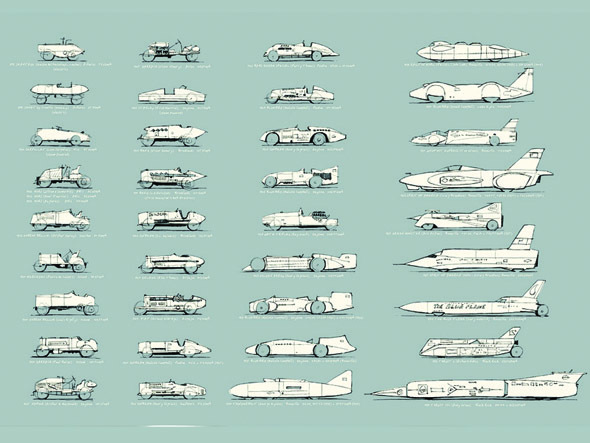 The most extreme evolution in the early NASCAR years was reflected in the so-called Aero Warriors, four heavily modified muscle cars with extreme aerodynamics built for the 1960 and 1970 seasons. Mopar built two of them, Dodge Charger Daytona and Plymouth Superbird while the other two came from Ford Motor Company: Ford Torino Talladega and Mercury Cyclone Spoiler II. By the late eighties, the cars stopped being specifically made for NASCAR by Detroit’s Big Three, and cars gradually became simple, highly modified bodyshells with visual cues taken from the current production models. The cars’ mechanics of the newest generations stock cars have been purpose-built and developed for NASCAR with no homologation needed to enter the competition. One of the biggest upsets in NASCAR came in the 2000s when Toyota joined the series. So far, Toyota hasn’t won any manufacturers’ championships, but the 2015 Sprint Cup champion Kyle Busch drove a NASCAR Toyota Camry to the championship victory. The first NASCAR-based track was the Darlington Raceway, an egg-shaped track built by Harold Brasington and the first asphalt track to host the NASCAR event in 1950. After Darlington, many more speedways followed, but the birthplace of NASCAR had to wait for its asphalt track until 1959 when Daytona International Speedway was opened. The track was built by Charles Moneypenny and NASCAR founder Bill France, and the inaugural race at the new track was held on February 22, 1959. The winner of the race was Lee Petty, father of Richard Petty, who later became known as The King of NASCAR and seven-time Daytona 500 winner. Ever since that February in 1959, it has been the season-opening NASCAR event. Year by year, stock racing became more and more popular. As the prohibition was finally over in the South, moonshiners could become professional racers with decent pays provided by growing sponsor pools and crowd-packed speedway grandstands. The main NASCAR series had several name changes from 1949 to today. At first, it was named Strictly Stock Series but changed its name to Grand National Series in 1950. The name stuck until the first big sponsor came in 1971. It was R. J. Reynolds Tobacco Company who got the naming rights and the series became known as Winston Cup from 1971 to 2003. The longtime sponsorship ended with the wireless provider Nextel buying the naming rights for the 2004 season, renaming the NASCAR series to Nextel Cup. Nextel was acquired by Sprint Corporation in 2005, but the series was renamed Sprint Cup in 2008. In 1969, Bill France Sr. opened the Lincoln, Alabama-based Alabama International Motor Speedway, or as it’s best known, the Talladega Superspeedway. The track was longer and faster than the Daytona International Speedway and since its opening, Talladega has been among the most popular NASCAR venues. One of the biggest NASCAR milestones was in 1972, the second year of Winston Cup era, when dirt tracks fell out from the schedule (although the last main series dirt event was held two years earlier, on September 30, 1970, and was won by Richard Petty), which marked the beginning of modern NASCAR. In 1974, Bill France Senior passed the baton to his oldest son Bill France Junior. The new CEO commissioned Bob Latford to design a new point system, with equal points awarded for all races no matter their prize money or duration. The newly developed point system ensured that drivers had to run all the races to become champions, and it was used without change from 1975 until the Chase was instituted for the 2004 Nextel Cup season. The France family is still in charge of NASCAR, with Bill’s son Brian France as its CEO since 2003, after a short presidency of Mike Helton, who was put in charge by Bill France Jr. after he was diagnosed with cancer in 2000 and resigned the position. However, the big breakthrough had to wait until the 1979 Daytona 500, the first flag-to-flag covered NASCAR race. A brawl between Cale Yarborough, Bobby and Donnie Allison that followed the end of the race crash really put NASCAR in the spotlight. That event was the defining moment in NASCAR history, drawing national attention to what would become the most popular American motorsport series. The race winner was the six-time champion Richard Petty who claimed his seventh NASCAR main series title by the end of 1979, a record unmatched until 1994 by the late Dale Earnhardt. NASCAR’s popularity has significantly risen in the early and mid-nineties, which coincided with the demise of IndyCar. The most popular drivers of the era, if not ever, were Dale Earnhardt and Jeff Gordon, two of the most accomplished racers besides Richard Petty. In the mid-2000s, NASCAR’s popularity started stagnating and slowly declining, but the new generations of drivers keep it alive, interesting and very well watched. NASCAR’s rise to national and international fame is the definitive automotive rags-to-riches story. It proves that all you really need to succeed are the people ready to drive the hell out of dirt ovals and the rumble of V8 engines to capture the ears and hearts of the rapidly expanding crowds. Simple, yet exciting as it is, NASCAR stock racing was, is, and forever will be the bona fide American motorsport and one of defining American sports in general. We here at l'art et l'automobile have an unrivaled passion for motorsports and the art and memorabilia that celebrates motorsports. So of course we look forward to the beginning of NASCAR season, and celebrate the history and adventure of NASCAR's creation, especially when the spirit moves us. Wink wink. Our hope is that you will celebrate with us and in that spirit, we wish to present our collection of NASCAR Artwork, Collectibles and Memorabilia. Click here to read more about it. It was this innovation—not the Model T itself—that cemented the automobile's future. When modern drivers think about the Ford Model T—if they think about it at all—they perhaps dimly perceive it as the car that changed the world. That is correct, of course, as far as it goes. But this month, the Ford Motor Company is quietly commemorating a T-related centennial that was the true source of that seismic shift in mobility: the automotive assembly line. The Model T just happened to be the product it was used to build. Indeed, the innovations could very well have been made by some other company and involved some other car. But in April 1913, led by production boss Charlie “Cast Iron” Sorensen, Ford began taking its first tentative steps toward a moving line that used conveyor belts to stream components past workers who performed one or two tasks each. This pioneering manufacturing process made automobiles affordable to just about anyone and became the template for the entire industry. 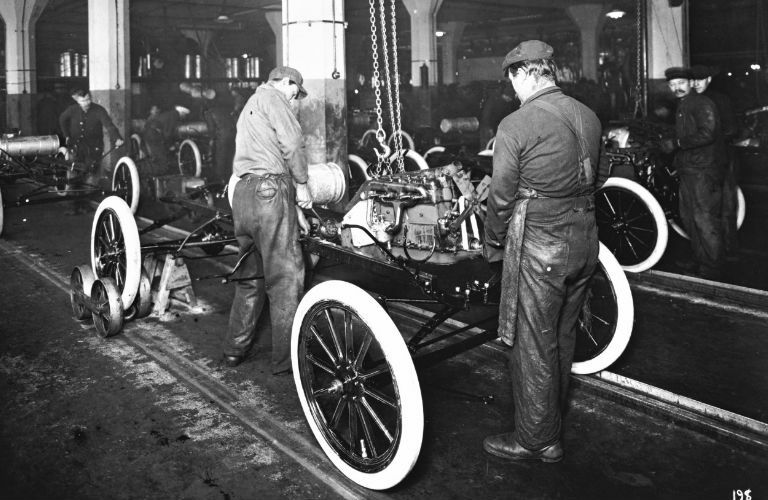 Prior to 1913, Ford and virtually every other automaker assembled whole cars at a station with a team of workers working together to complete a single example, usually from start to finish. Like other companies, Ford had made numerous refinements to the process, achieving impressive production totals at the Piquette Avenue plant where the Model T was born in October 1908. When deciding to implement the assembly line, neither Sorensen nor Henry Ford nor anyone else involved had the benefit of time-motion studies. They simply reasoned that moving the component at a fixed rate past each station would reduce the number of workers required to build the cars, reduce the time required for assembly, increase volume, and allow the company to control the pace. The guinea pig was the T’s magneto, a component that supplied ignition energy to the engine before generators became common. A complex and innovative component that was one of the early Model T’s technological advantages, Ford’s magneto was integrated with the engine’s flywheel and involved many pieces. Under the old system, each magneto was assembled by one worker. On average, that worker could assemble 35 of them in a nine-hour shift, or roughly one every 15 minutes. After some tinkering with the line rate and other factors, Sorensen and his cohorts achieved results that were probably startling even to them. Starting with 29 workers performing 29 different tasks, the experiment reduced assembly time by about seven minutes per unit. And with more refinements, Sorensen was able to reduce the magneto-line workforce to 14 and cut assembly time to five minutes. It didn’t take long for Sorensen to apply the moving-line principle to all aspects of Model T production. Engine assembly time was cut from almost 10 hours to less than four. The team tackled chassis assembly in August and quickly cut completion time from 12 hours to six. It was down to slightly less than three hours by October, then to 2.3 in December. By October, Ford’s vast plant in Highland Park, Michigan, was a maze of conveyors, powered drive belts, overhead traveling cranes, and hundreds of machine tools. Moving assembly went into full swing. And the efficiencies established on a small scale with the magneto line translated directly to total production, which exploded. Four years prior, while construction crews were at work on the gigantic Highland Park facility, the Piquette work teams assembled 10,660 Model Ts, keeping Ford atop the manufacturing standings ahead of Buick. In Highland Park’s immense spaces, production for 1910 rose to 19,050, despite various hiccups associated with settling into the new facility. By 1912, output was up to 68,773. But those numbers were dwarfed by the results of the moving assembly line. The process netted 170,211 examples in 1913, 202,667 in 1914, well over half a million in 1916, and 735,020 in 1917. All U.S. industrial output was down in 1918, a casualty of the final year of World War I, as well as the economic downturn that followed in its wake. But the market rebounded in 1920, and Model T production topped one million cars for the first time, at 1,301,067. Output peaked at 2,011,125 in 1923, followed by almost two million units in 1924 and ’25 before demand finally began to tail off. Verging on obsolescence and dowdy compared with many competitors, the T finally went out of production on May 26, 1927. Although final tallies vary, the generally accepted total stands at just over 15 million built. Henry Ford’s much publicized Model T mission was to “build a car for the great multitude,” and the key to the quest was economies of scale, making the car affordable to as many potential customers as possible. When the car made its debut, it was innovative, simple, rugged, and easily repaired by owners with even modest mechanical skills. But it wasn’t exactly cheap: $825 for a basic Runabout, the least expensive model, and $850 for the five-passenger Touring version. The pricing didn’t include extras such as a top or side curtains and actually increased to $900 and $950 for 1910. But as production numbers soared, the prices went down. Ford charged $600 in 1913 for a Touring T, $440 in 1915, and $360 in 1917. Pricing bottomed out at $290 for a 1925 Touring model (the Runabout cost $30 less) and ramped up slightly in the last year and a half of the Model T’s long life. The assembly innovations at Highland Park did not go unnoticed. The multiple buildings of Ford’s big facility regularly welcomed visitors, and it wasn’t long before competitors began adopting the techniques developed there. So by the end of the Model T’s 19-year run, it was fair to say that Ford really had put the world on wheels. One of the more noteworthy chapters in the moving-assembly story was Ford’s announcement on January 5, 1914, that the company was increasing its wage rate to $5 per eight-hour workday—more than double the existing rate for the then-standard nine-hour day. Ford was already racking up huge profits, and the new policy could be interpreted as altruistic, although other automakers received the news with clenched jaws. There was open speculation that Henry was only aiming to ensure that his workers could afford to buy the products they were assembling. But Ford’s motives were far more pragmatic. Assembly-line work—performing the same tasks every day for long hours at a stretch—was mind-numbingly dull, and the company found itself beset with unacceptable turnover in its labor pool. In 1913, for example, Ford was forced to hire more than 52,000 workers to sustain a workforce of about 14,000. There were strings attached to that $5 bill. The basic wage was $2.34. To qualify for the additional $2.66, a worker had to meet company standards for clean living, including sobriety, no gambling, thrift, and a happy home environment. Ford actually formed a sociological department whose staff members visited homes to assess workers’ worthiness for the full five bucks. That policy would provoke torch-bearing mobs and militant picket lines today, but it was acceptable in 1914 and produced dramatic reductions in absenteeism and turnover. Moreover, the $5 day attracted job seekers from all over the country, particularly the South, permanently changing the demographics of Detroit. Other changes were even more profound. The availability of an affordable, durable automobile put the dream of unlimited personal mobility within reach of a broad swath of society, setting the stage for the rise of the suburbs and the establishment of a national highway network. Automobiles were no longer a novelty when the Model T made its first appearance, but they were far from universal. By the time the last T left the line, the automobile was fully integrated into everyday life, and the world would never be the same. 1914. The $5 day, roughly double existing wages, attracted workers from all over the country. Here, an estimated 10,000 applicants brave early January weather in hopes of employment. All Model Ts were black. Not true. The “any color you want, as long as it’s black” ethic began in 1913. Folklore says the black color was a Japanese lacquer chosen for its fast-drying properties. Also not true. The black paint was cheaper and more durable. Ford restored colors to the Model T palette in 1926. The Model T was all-new. Not quite. 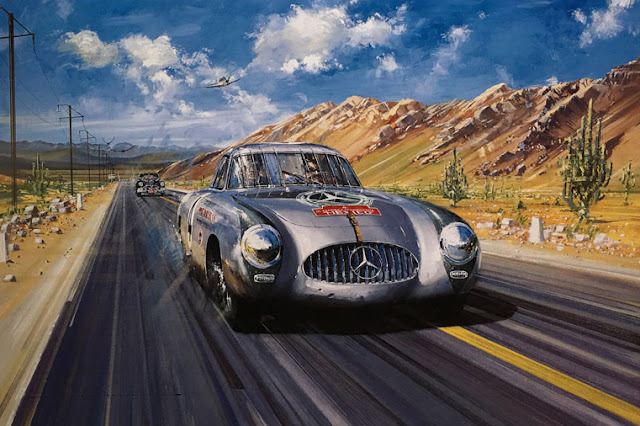 It was innovative and included the extensive use of vanadium steel, which was stronger and lighter than ordinary steel; an integrated flywheel/magneto; and a monoblock four-cylinder engine with a removable cylinder head. It was also lightweight, at about 1200 pounds. But for all that, it was an evolution of the highly successful Model N (1906–08). The Model T never changed. Wrong. Ford made a number of mechanical and cosmetic running changes to the T over the years, including the introduction of safety glass in 1926, an industry first. But the Model T failed to change in key ways. It retained its two-speed planetary transmission long after competitors were offering three-speed gearboxes with shift levers, the cooling system was via thermosyphon (meaning no water pump), and electric starting wasn’t even an option until 1919. The Model T was hard to drive. Quite the opposite. Compared with other cars of the day, it was easy once a driver acquired minimal skill in advancing or retarding the spark. The hard part was cranking the T’s engine to life. It was prone to backfires, accounting for a good many fractured limbs over the years. For more, check out our feature "How to Drive a Model T."
We here at l'art et l'automobile have a passion for how the legendary automobiles of the past were envisioned, designed and built, just as intense as our passion for how they are celebrated and rendered into art and memorabilia. We would like to honor Ford's monumental achievement, bring the automobile to the mainstream consumer through the use of the assembly line, by sharing a little history on the subject, that will hopefully enlighten you just a little bit more on the amazing history of our shared love; the automobile. Remember, this week we are hosting our Special 12 days of Christmas Online Auction, which opens for bidding December 1st at 12pm (noon) and Closes at noon on December 13th. This Auction contains many exciting, recently acquired pieces of Artwork, Memorabilia and Collectibles that would be perfect for filling your stockings or going under your tree this Holiday Season. Viewing has already begun at arteautoauction.com, so you definitely don't be a Grinch or you might get scrooged out of these amazing items. 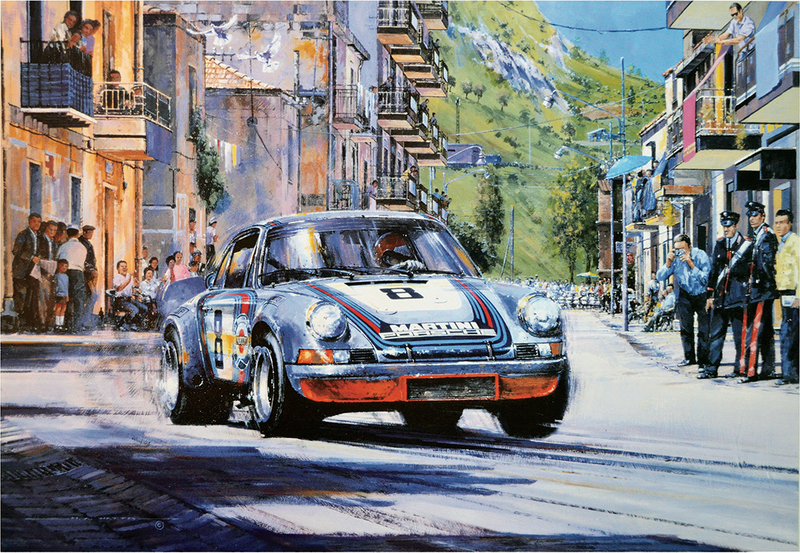 Also, for great automotive artwork and memorabilia, don't forget to browse the many categories on our WEBSITE. Remember we also have many more items in our gallery, do not hesitate to contact us if you are looking for something in particular. 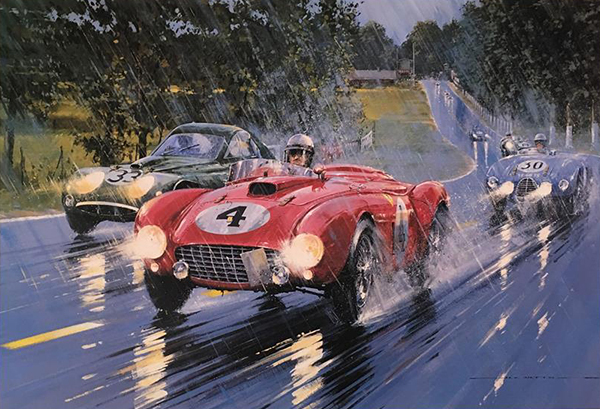 Also be sure to check out our Newsfeed, which has details on our collection of Ford Artwork, and Memorabilia.